Daniel Elmer Hinshaw3,7,8,9,10 [Elmer Hinshaw2,11,12,13]. Born Apr 14 18743,9,10,13,14,15 [Apr 14 18751,2,7,12,16], Jasper County, Iowa3,9,10,13,14,15. He married Etta B. Blair1, 18991 [about 19022]. Etta, daughter of - Blair & - Jack1,9,14,15, was born Mar 9 18741,9,14,15 [May - 187413, about 18772], Iowa1,9,14,15. Hinshaw, Elmer, head-of-household, age 26, born Apr 1874 in Iowa; parents born in Tennessee; married 0 years; occupation: mechanic; rented home. 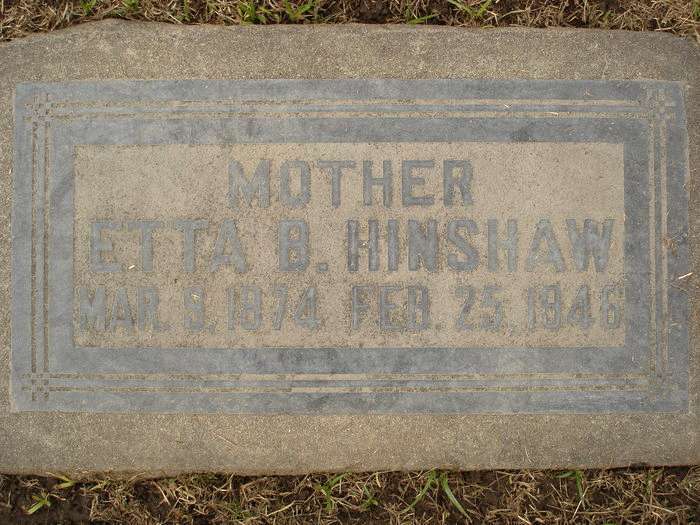 Hinshaw, Etta, wife, age 26, born May 1874 in Iowa; father born in Ohio; mother born in Illinois; married 0 years; no children. Hinshaw, Uriah, head-of-household, age 64, born in Tennessee; parents born in Tennessee; first marriage, married 45 years; occupation: own income; rented home. Hinshaw, Margeret L., wife, age 65, born in Tennessee; parents born in Tennessee; first marriage, married 45 years; 8 children, 4 living. Hinshaw, Elmer, son, age 34, born in Iowa; parents born in Tennessee; first marriage, married 8 years; occupation: carpenter, house. Hinshaw, Etta, daughter-in-law, age 33, born in Iowa; parents born in United States; first marriage, married 8 years; 3 children, 2 living. Hinshaw, Merritt, grandson, age 5, born in Iowa; parents born in Iowa. Hinshaw, Bertie, grandson, age 1 year 1 month, born in California; parents born in Iowa. Gertama, Florence, servant, age 20, born in Iowa; parents born in Holland; single; occupation: servant, private family. Hinshaw, Daniel E., head-of-household, age 45, born in Iowa; parents born in Tennessee; owned home; occupation: carpenter, house. Hinshaw, Etta B., wife, age 45, born in Iowa; parents born in Ohio. Hinshaw, Merritt B., son, age 15, born in Iowa; parents born in Iowa; attended school. Hinshaw, Alfred B., son, age 10, born in California; parents born in Iowa; attended school. Hinshaw, Daniel E., head-of-household, age 55, born in Iowa; parents born in Tennessee; first married at age 28; owned home ($4000 value); radio in home; occupation: carpenter, farm; not a war veteran. Hinshaw, Etta B., wife, age 56, born in Iowa; parents born in Ohio; first married at age 28. Hinshaw, Alfred B., son, age 21, born in California; parents born in Iowa; occupation: salesman, retail vegetables; not a war veteran. He then married Ada (Janeway) Beckwith1 [Ada Janeway1], Dec 20 19471, Nevada1. 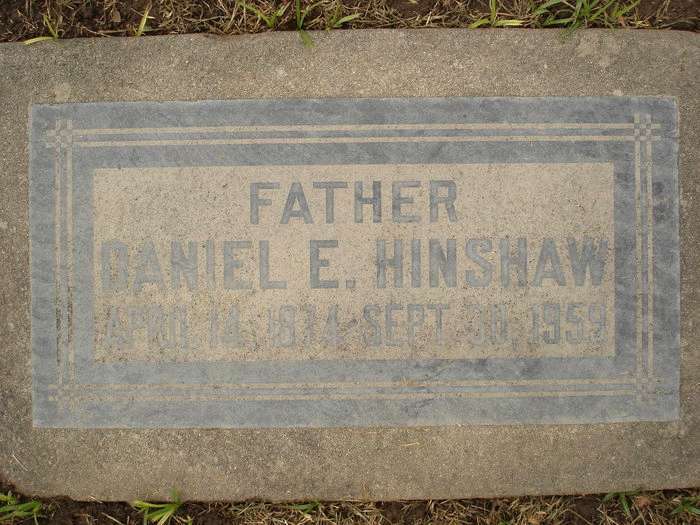 Daniel Elmer Hinshaw died Sep 30 1959, San Diego County, California; buried Rialto Park Cemetery, 200 North Willow, Rialto, San Bernardino County, California. 1910 census, 1st Ward, Newton, Jasper County, Iowa; roll T624-407, ED 32, page 170B, line #90, dwelling #265, family #270. 1920 census, Rialto Township, San Bernardino County, California; roll T625-129, ED 182, page 11B, line #84, dwelling #52, family #52. 1930 census, Fontana Township, San Bernardino County, California; roll T626-188, ED 133, page 8A, line #34, dwelling #240, family #241. California Death Index, 1940-1997; http://www.ancestry.com. The Church Of Jesus Christ of the Latter Day Saints (LDS) International Genealogical Index (IGI) - Iowa. Lineages, Inc., comp. "Gene Pool Individual Records". Provo, UT: Ancestry.com, 2000. 1880 census, Kellogg Township, Jasper County, Iowa; roll T9-346, ED 93, page 67D, line #29, dwelling #305, family #320. 1885 census, Kellogg Township, Jasper County, Iowa; pg 404, line #14, dwelling #49; USGenWeb Archives. 1900 census, 3rd Ward, Newton, Jasper County, Iowa; roll T623-439, ED 31, page 9A, line #27, dwelling #208, family #209.